Length: 6 hrs. 15 mins. The frighteningly hip teenage children of the world's most famous monsters have gathered together under one roof...to brave the horrors of high school! Always overshadowed by her six brothers and her fab friends, Clawdeen Wolf plans to finally strut her stuff in the spotlight at her upcoming Sweet Sixteen bash. But after The Ghoul Next Door goes viral, it's into the woods for the family Wolf. Clawdeen goes stir crazy lying low at her family's B&B with her annoying brothers until Lala shows up to keep her company. But is the vamp flirting with Claude?! 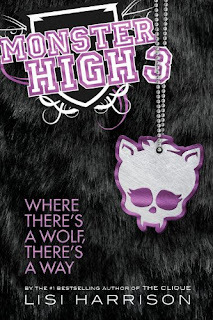 In this the third book of the Monster High series, readers are finally introduced to the fashionably furry Clawdeen Wolf. She seems quite the force of nature in her own right, though she seems to spend most of the book trying to escape the watchful eyes of her family. All she wants to do is to celebrate her sixteenth birthday in style,but with most of the RADs in hiding and her family's paranoia about "normie" backlash, there may not be much partying in her future. This book was really a joy to read due in large part to the fact that characters that had been window dressing previous books are allowed to fully develop and join the cast of the drama being played out within this book. Case in point...Melodie. She seemed to wander the first two books as the RAD friend with unexplained issues. In this book however, all is revealed and and what Melodie learns about herself will change her life forever. This book is a great way to get your tween to read. The story lines deal with issues such as acceptance and friendship highlighting the concept of self esteem. I would recommend this book and the series to any Monster High lover. If you have the dolls...get the books! This was one of the few cases in which I was underwhelmed by the performance of the narrator. Liz Morton offered little to no differentiation between her portrayal of the male character and the American females. Her best work was in giving voice to Lagooona Blue. There could have been so much more done with this book. My advice to the author would be to hire the cast that voices the cartoon to do the book.